Summary : An absolute beast considering it's so small, this Aspire Gusto Mini review is a super positive one. It's great for vape beginners and veterans alike! Hello, vapers! How’s the day going for you? It’s time for a new review and I decided to bring you the Aspire Gusto Mini review. Those of you who have been following me for a while will know that Aspire and I don’t tend to get along so well. I DID like the Aspire Nautilus Mini. Quite a lot, in fact; I used it for a really long time. I DIDN’T like the Aspire Cleito EXO tank at first, although the 0.4-ohm update was much more positive. On the other side, I LOVED the PockeX at first, but then the damn thing started pouring liquid out of every and any hole. Oh, and almost every packet of Aspire coils I’ve purchased has contained at least ONE faulty coil. Don’t even get me started on customer service. The good news — I don’t think the Aspire Gusto Mini is crap. In fact, I may have just found an Aspire product that I can REALLY get along with. The bad news — There isn’t any. That’s a lie, there are a couple of tiny bad points, but that’s it. I’ve really hunted for a reason NOT to like the Aspire Gusto Mini, mostly because of the above bad experiences, but I love it. Oooooh, she’s eatin’ her Aspire-hating words. You get the Aspire Gusto Mini device in the box (obviously), with a USB charging cable, the instruction manual, and warranty card. You do not get disposable pods in the box, so you will need to buy these separately. Can we just go back to the price for a moment? I actually thought this device was going to be a lot more expensive than it was. For under £20, this is an absolute bargain. Let’s get one thing straight nice and early; the Aspire Gusto Mini is designed to be a small and discreet device, and it is small and discreet. I thought I only had half of the device at one point. I have small hands and this device is still small discreet. Small devices still look pretty big in my hands, usually. I would be tempted to buy this if I were a commuter or keep traveller. Back in the day when I used to live in all sorts of weird and wonderful places around the world, I would travel a lot. I’ve flown as both a smoker and a vaper, desperately trying to get my vape-hit in bathrooms across the globe. This little device sure would have come in handy back then. Not just tiny in size, the Aspire Gusto Mini weighs barely anything. It’s so small and light, I kept losing it on the messy desk in front of me. Yep, despite being bright blue, I still need something the size of a house brick in order to easily locate it. Perhaps I should wear my glasses more often? The design: It’s cute and discreet, but not so cute that I think men would be put off by it. I love the colours too. I wouldn’t have purchased blue for myself, but I sure think this is a fun little vape. The window on the side: This allows you to see how much liquid is left in the pod. There’s nothing worse than a dry hit. The battery capacity: The Aspire Gusto Mini has a 900 mAh battery. I estimate this would give you about eight or nine hours worth of vaping (MTL). I actually didn’t use this device anywhere near as much as I would have used other devices (reasons below — good ones, not bad), so found that the full charge actually lasted me almost three full days. It usually dies somewhere around the 2-2.5 day mark. The cover: It doesn’t come off too easy. I felt like the Aspire Archon’s case sometimes just fell off whenever it felt like it. This hasn’t happened once with the Gusto Mini. The window on the side: It has sharp edges. I didn’t like the way it felt against my finger. With repeated use, it actually left a little scratchy-mark on my finger. I think the edges need to be smoothed off a bit, or something needs to be added there. I know that’s a ridiculous thing to moan about, but with so many GREAT vape devices out there, you need to have all your ducks in a row before you release it. It just feels like it’s missing a bit, even though I know it’s not. That’s also where air is sucked into the device, so a plastic or glass window would prevent that nd restrict airflow. I don’t really know what I was expecting, but when I saw the name “nic salts,” I just sort-of assumed they’d be a little like smelling salts. (Yes, I do appreciate that this isn’t entirely logical.) I remember my Great Nan having a couple of little bottles of smelling salts in her handbag and I once took a great bit sniff and almost died. There was blood. I almost passed out. Maybe I won’t make that mistake again. I found these pods hilarious, especially with the little tentacle-things dangling down from the bottom. You will need to pull these bits off when you’re ready to install the pod. They release the liquid from the main chamber of the pod into the bottom section where the coil is. Just a quick word of advice: Eliquid will occasionally flick out of the pod when you pull the tentacles out. (I should probably find out what they’re actually called.) I wouldn’t aim it in the direction of your face when you’re pulling them out. You also need to tug on them with some force. Those rubbery bits don’t come out easy. A single pod contains 2ml of liquid. This is essentially one tank-full. You get three pods in a box for just under a tenner, so one tank of eliquid is going to cost you £3.33. That sounds like a lot of money, right? It *IS* a lot of money. For some people £3 or £4 will get a 10ml bottle of eliquid — FIVE times what you would get in a single pod. But wait, before you freak out about the cost (like I did at first), the unit and pods together are actually going to be MORE economical. Element and Aspire clubbed together to create the Aspire Gusto Mini kit and Element NS20 Designer Nic Salt combo to “change the throat characteristics” of vaping — to give a vaper (or smoker looking to switch) the same nicotine amount that they would need to be satisfied, but without having to inhale a whole bunch of times. So, let’s say that you get the nicotine hit that satisfies you for a while from 10 or 15 puffs of your favourite vape device or one whole cigarette (if you’re still a smoker). The Aspire Gusto Mini kit with Element NS20 Designer Nic Salts would give you the same nicotine hit as the 10-15 puffs of your vape or an entire cigarette, but in fewer puffs — maybe 3 to 5. You’re still getting enough nicotine to stop you from going cranky, but you’re getting it in a more condensed fashion. It DOES NOT feel like you’re vaping with a very strong eliquid. In fact, it’s like vaping with high-strength mouth-to-lung liquid (50VG/50PG), but with the throat hit of sub-ohm liquid (high VG). It IS NOT super harsh on the throat. It’s actually very smooth. Is the Aspire Gusto Mini a sub ohm device? If you watch the unboxing video, you’ll see a whole load of me being confused and trying to work out which way you should vape with it — is the Aspire Gusto mini a sub ohm device or an MTL device? Well, I soon solved the problem – you can use it both ways. It vapes at 17 watts, and it works just as well as a mouth-to-lung device as it does a sub-ohm device, all from the same pod. I don’t know how it works, it’s all very clever if you ask me, but it does work really well. You can use it as a both without changing anything — no buttons, no coils, nothing. Nice n’ easy! I used the device both ways in the video and the only differences are: the amount of flavour you get out of it and how much vapour it produces. You get less vapour when you vape the MTL way than when you vape the sub-ohm way. You get more flavour and more vapour when you vape the sub-ohm way. In terms of flavour, however, it only changes a teeny-tiny bit. It’s barely noticeable and both are very impressive, but you definitely get a touch more flavour when you’re sub-ohm vaping with it. I personally prefer vaping with the Aspire Gusto Mini the sub-ohm way, rather than MTL. I find MTL just a little too scratchy with certain flavours, but not so scratchy that I can’t use it. It makes me cough if I use it a little too often, or if I take a big inhale from it and I’m not quite ready for it. Sub ohm vaping, on the other hand, I find super smooth and very enjoyable, every time. It’s never made me cough (apart from that one embarrassing incident on the unboxing video where I didn’t leave the pod to sit for long enough and dry-hit myself to death). MAKE SURE YOU WAIT 10 MINUTES AFTER ACTIVATING THE POD BEFORE VAPING WITH IT. Do not do what I did: shake the pod around for a bit, shove it in, wait two minutes and then start vaping. The pod won’t be ready yet. Not all the liquid will need to get to all of the areas it should get to, and then it’ll just taste rank. Again, if you’ve watched the video, you’ll have seen my face. Can you refill Aspire Gusto Mini pods? I used the teeniest-tiniest tweezers I owned to try and flick it out (as such). You’ll need to be careful when you do it — think of it like trying to get the cork out of a bottle of wine when you don’t have a corkscrew. (We’ve all been there.) One wrong move and I reckon that little rubbery bit would pop right down into the chamber and then you’d be totally screwed. If you want to refill the pods yourself, wear gloves, and be prepared for things to get messy. The tiny hole is much smaller than most eliquid nozzle tips. I don’t think there is a way of replacing the coils, and I honestly have no clue what kind of refill eliquid you would put in the pod, or how long the coils would last after the pods were refilled. They are only designed to be used the once after all; the duration of one 2ml pod. I’m assuming you would refill the pods with nic salt liquids in bottles, rather than regular eliquid? I’m going to have a play around here and see what happens. I don’t know how the pod would work with 50VG/50PG eliquid in 1.8% (as an example), and I can see sub-ohm (high VG) eliquid being far too thick. You’d have a tough time trying to get it through the hole before anything else. Can you refill the Aspire Gusto Mini pods? Yes, but it appears to be an absolute ball ache. I don’t know if I could be bothered with all that. The pods themselves: I LOVE that you can just take one pod out and replace it with another if you get bored of a flavour or don’t like it much. I actually REALLY, REALLY love that. I’ve been known to use a coil for just a couple of hours before I get bored or don’t like the liquid, throwing it all out and starting again with a different flavour. At least I don’t need to waste a coil or go through the tank rinse n’ clean process if I don’t like one of the pods much. Pod flavour: The flavours are AMAZING. I’ve tried a few Element flavours in actual eliquid form and, although not all flavours were to *MY* taste, they were all packed with flavour and really true-to-taste. The same can be said for these pods. There’s no fade or dull-down — you get the same great flavour from the start of the pod, right through to the end. I vaped less: I got a lot of stuff wrong about nicotine salts when I first started researching them, something I go into in a lot more detail in my videos. One of the things I predicted was vaping with the Aspire Gusto Mini less frequently than you’d vape with other devices. Over those three days, I must have picked up the device approximately 10 times per day. That’s how come the pod lasted me for three days. I guess nic salts do leave you feeling satisfied sooner. Nothing was out of the ordinary — they were three standard working days for me. I would usually have chain-vaped like a mo’fo, but I didn’t. My lungs were given a break. My bank balance was given a break. If one pod lasted me for 2-3 days and there’s 3 in a box, I would get about nine days worth of vaping out of a £10 box of pods. That’s FRICKIN’ impressive, folks. The Aspire Gusto Mini is worth it for that alone in my eyes. Pod stiffness: I showed you this in the video — sometimes the pod is quite stiff to get in and out of the device. It gets a bit stuck at the bottom, and it feels like you’re going to break it if you pull any harder. Just keep pulling — mine gets stuck every now and again, but a quick, forceful tug always breaks it free without any further issues. Pod size: 2ml pods. When I first opened Vape Club’s surprise package, I moaned like crazy about the size of the pod, BUT I vaped the Element Strawberry Whip Nic Salts pod for close to three WHOLE days. A 2ml tank would NEVER last me that long. I think I just negated my own ‘I-don’t-like’ point. This sounds a bit bloody scary, but I feel it is my duty to tell you to go easy on this little beast. I went crazy on it when I first got it going and I suffered a mega head rush. It was almost as though I was transported to my early teens again, back to the days where I first started smoking and nicked my Nan’s Red Band cigarettes. Oh, back in the good ol’ days when you get 10 cigarettes for under £2. Do you remember those days? Anyway, when my innocent and not-ready smoker used to inhale deeply on those superkings, I’d get the biggest head rush, my fingers feeling a bit ‘fizzy’ and my eyes going a bit weird. It’s the same feeling I had when I used the Aspire Gusto Mini with Element NS20 Designer Nic Salts. Go easy on it, okay? Start light, work your way up. MAKE SURE YOU LEAVE YOUR POD TO PRIME FOR LONG ENOUGH. I really like the size, although this device might be a little *too small* for some. When I say it’s diddy, I mean it’s really diddy. If you prefer a bigger device, you’re probably going to find this one a little delicate. I really like how it works — being able to use it as both a sub-ohm device and a mouth-to-lung device, without the need to change coils, liquids, or modes really appealed to me, and I think it will really appeal to a lot of new vapers too, and also vapers who aren’t sure whether they’re going to like MTL vaping or sub-ohm vaping. It gives you the best of both worlds — you can opt for little clouds of vapour with a bit more throat hit if you vape the MTL way, or more clouds and flavour when you sub-ohm. It’s a bit like having two different devices in your pocket, all wrapped up into one. Nice and easy to use, the Aspire Gusto Mini is perfect for someone who doesn’t like vaping with something that has too many modes and settings. Just the one setting, just plug-in-and-play, there’s not very much that you can do wrong with it, apart from not leaving the pod to prime for long enough after removing the tentacles. Combined with a kickass battery life, I think you’ve got something you can actually rely on, whether you’re a new vaper or a ‘veteran’. Oh, and did I mention that you could change the drip tips too? Would I buy the Aspire Gusto Mini again? Absolutely yes. I’d miss it a lot if mine broke. Would I recommend the Aspire Gusto Mini to you? Again, absolutely yes. If you used it and it broke, I reckon you’d miss it a lot. 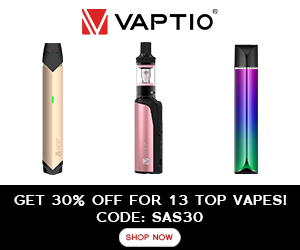 🔗 Check what else Vape Club has to offer HERE. HONESTY POLICY: I was sent The Aspire Gusto Mini + Element NS20 Designer Nic Salt Pods Kit by Vape Club for a review. I did not pay for these vape products. I was not paid for my review and I will not be paid for my HONEST review. All opinions are mine and in no way influenced by the store, brand, or manufacturer.